Casa Padrino offers a sumptuous selection of beautiful and extraordinary make-up tables in shabby chic and country style to choose from. Shabby Chic means "shabby chic". In truth, this shabby chic is anything but shabby, since this style is a skilful blend of heirlooms, flea market bargains and home-made. Exactly this mixture makes the Shabby Chic, because the Shabby Chic is a combination of the old, new and strange. This lovely character gives the style noble and valuable accessories, shimmering materials or antique furniture. Shabby chic is characterized by natural or artificially created traces of use such as chipped paint, seemingly untreated, coarse wood and textiles with patterns of bygone days. 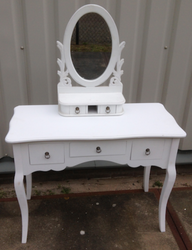 A separate dressing table is the dream of many women and girls. These special tables create a touch of boudoir and are also practical for storing perfume, jewelry, make-up etc. 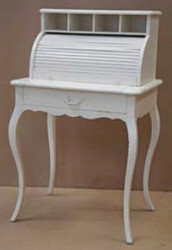 At Casa Padrino you will find a wonderful selection of beautiful dressing tables with matching stools for a good price. 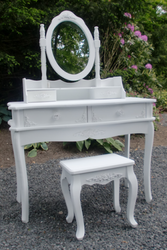 A dressing table is a piece of furniture with a long tradition. It exudes a touch of luxury and elegance in the rooms in which it stands. But such a cosmetic table should not only be decorative and beautify the bedroom, it should also have enough space for brush, jewelry and perfume bottles. A dressing table is often equipped with a mirror, a large shelf and drawers, which provide plenty of storage space for the make-up utensils. This makes the cosmetic table a true organizational talent and for many women an indispensable must have. Whether in the romantic country house style or in the trendy shabby chic style, at Casa Padrino you will find a large selection of beautiful make-up consoles. Fulfate a girl's dream with a make-up table. In addition, we use only the highest quality materials to ensure the highest quality standard for your needs.